Is there a more exact ETA on this one? We will probably get the next GMT update in a week or two and I would expect it to ship end of the month / start of August I guess. Subscribe to the GMT newsletter if you have not already. This charged on Tuesday. Will probably ship either last week of July or early August. Great! And I do subscribe to the aforementioned newsletter. The C. Kibler map graphics look very good so far, reminiscent of the old Command game map style while also appearing up to date. Looking to be one of the better wargame deals this year, 2 games for a reasonable price. Seems it has been delayed? It is the only P500 item schedules for early august that is still in "final production"
As of about a week ago they were only waiting on the boxes. They are in the middle of shipping out two other new games so even if the boxes showed up this week I doubt anything would get out the door for a bit. 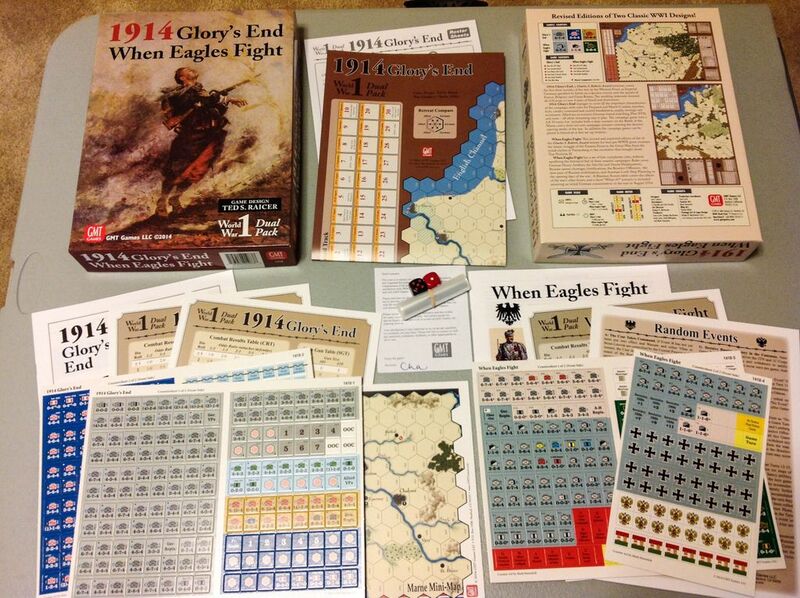 "A close-up of the 1914: GLORY'S END map, part of the WWI dual pack from Ted Raicer. Shipping once we get all the distrib orders for FIRE IN THE LAKE and WON NY THE SWORD out the door." Somebody at GMT loves you, Marco! GMT Website still shows as "Charging"
Just got an email from GMT saying it shipped via UPS today!! Just got my notice today! Scans of the countersheets have been uploaded. Note that the back of the box says two maps, when in fact there is one double-sided mapsheet. Having a pad of doublesided roster sheets is a nice touch.